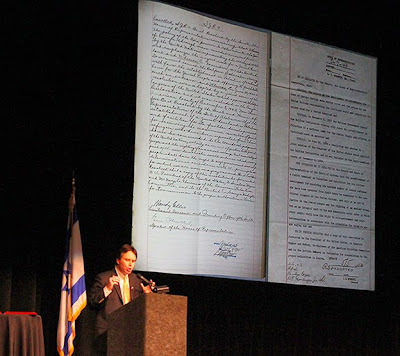 A devoted group launched the Alabama-Israel Task Force on March 25 with a statewide event in Huntsville that centered on Alabama’s long legacy of support for the Jewish state. A 1943 joint resolution of the Alabama Legislature calling for the establishment of a Jewish homeland was a common theme that wove through the evening, which drew about 250 to the Von Braun Civic Center Concert Hall. The evening was about using the recollection of 1943 as a springboard to rededication and new alliances between Alabama and Israel, and among different pro-Israel communities in the state. Rabbi Laibel Berkowitz from Chabad of North Alabama gave an invocation in Hebrew and English, then Pastor Emilio Sanchez of Calvary Assembly gave his in Hebrew, English and Spanish. Alabama Lieutenant Governor Kay Ivey represented the state at the event, as presiding officer of the Senate, where the 1943 joint resolution originated. Ivey referenced the Purim theme, which was part of the evening, by referring to how Esther was told “if you remain silent at this time, you and your father’s family will surely perish” and she was put in her position for just a time as was upon them. Ivey noted 1943 was when “the height of World War II was raging and Jews were being persecuted. At such a time as this, Alabama leaders took their position and used it to stand solidly for Israel.” And that support has continued, she added. Commemorative plaques with the resolution’s text were presented to several individuals. Earlier in the month, Alabama delegates to the American Israel Public Affairs Committee conference in Washington presented those plaques to the entire state Congressional delegation. Ivey received a plaque, as did Spencer Collier, state director of homeland security. Israeli Consul General Opher Aviran of the Atlanta consulate was slated to receive one but was unable to attend because Israel’s foreign ministry is on strike. Then, there were two special presentations to those who have a long history of support for Israel in Alabama. In the Jewish community, Mobilians Arlene Mitchell and her late husband, Mayer, were recognized. Jimmy Grodnick accompanied Mrs. Mitchell onstage. In the Christian community, Alabama Supreme Court Justice Tom Parker and his wife, Dottie James Parker, were recognized. Mrs. Parker sang “Hatikvah” at the 1995 inauguration of Governor Fob James, and during James’ first term she was supervisor of the Governor’s Mansion when they had a celebration for Israel’s 33rd birthday in 1981. Buhler recounted how Mrs. Parker’s mother, Miriam James, wrote to President Harry Truman in 1948, giving him numerous Biblical reasons and verses for the United States to recognize Israel. Truman wrote her back, agreeing and thanking her. Daniel Odrezin of the Birmingham Jewish Federation shared the stage with Union Hill Primitive Baptist Church Pastor Oscar Montgomery, co-founder of the Greater Huntsville Interdenominational Ministerial Fellowship, to read a Public Declaration of Reaffirmation based on the 1943 resolution. The reaffirmation is also available online for people to sign. Adding to the unique Alabama-Israel flavor was the screening of a video of “Sweet Home Jerusalem” by Rabbi Lazer Brody of Emunah Outreach, a takeoff on the Lynyrd Skynyrd hit. Numerous greetings were read from those who could not attend. Because of Congressional business, Rep. Mo Brooks was unable to attend in person, and ethics rules forbade him from doing a video greeting because it is within six months of a primary election. In a message that was read during the event, he spoke as a “strong advocate of America’s alliance with Israel” and referred to his 2011 visit to Israel. Messages also came from former Israeli Ambassador Danny Ayalon, Minister of Homeland Protecton Gilad Erdan, Knesset Member and former Shin Bet Deputy Director Yisrael Hason and Regional Development Minister Silvan Shalom. The first initiative for AITF is support of the Israel Leadership Institute in Sderot. Founder Eeki Elner was on hand for the evening, which he said was his fifth trip to Alabama in 14 months. Donations from the evening are going toward an Emergency Preparedness and Disaster Response Center at ILI, which will train emerging young leaders in Israel in emergency and disaster response. In a later stage, Alabama young leaders will be invited to train and share workshops with their Israeli colleagues. Laura King, past president of the Jewish Federation of Huntsville and North Alabama, said Sderot is “the most dangerous and challenging location in Israel today,” located one mile from the border with Gaza, and subjected to thousands of rockets fired from Gaza by the Palestinians over recent years. One such rocket struck Elner’s house. She noted the difficulty of her position on the program — following a performance of “Shalom Israel” by the Perfect Praise Early Childhood choir as three young boys held the flags of Israel, the U.S. and Alabama. Rabbi Steve Silberman of Ahavas Chesed in Mobile closed the evening by referencing the week’s Torah reading, the dedication of the mishkan, the “dwelling place.” In the exhaustive detail about the construction, the Hebrew term “l’chaber,” to join, was used repeatedly. The word “chaver” means friendship, and from the joining of hands comes friendship. “There are no greater building blocks for God’s holy place than friends extending hands to one another in friendship,” and that act of joining together ensures the holy presence.